Create a list of songs to playback continuously in a particular order. 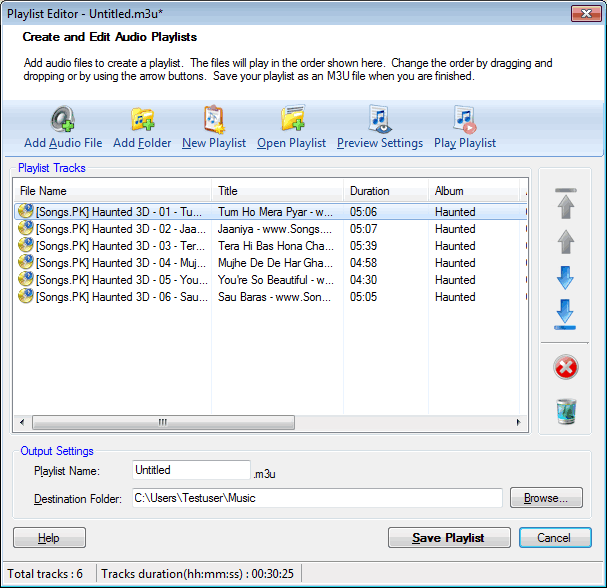 The playlist is created in the M3U format and can be played with the Windows Media Player and the QuickTime Player. Most of the popular portable players such as the RIM BlackBerry, Sony PSP, and many more can play your M3U playlists. Click Tools >> Create Playlist. You can add audio files or folders containing the audio files from your PC to create a playlist. When you add a folder, you can choose to include the music files from its subfolders as well. You can start creating a new playlist or open a existing playlist. Choose the order of the tracks for playback by rearranging them. Use the arrow buttons present on the right side of the Playlist Editor. Along with rearrangement you can also remove a particular track or all the tracks from the playlist. Preview Settings allows you to append extra information to your file name like the artist name and album name and prefix a number to the title. Before you save your playlist, you can listen to it by clicking the Play Playlist button. When you have finished creating and arranging the playlist, Save the Playlist. You can specify the destination folder with the Browse button.